Good morning, everyone. The weather in NW Oklahoma is beautiful right now, except for the wind, but that's no surprise. The air is as cool as silk on the skin, and the morning and evening light is perfect. Even the mid-day sun has lost much of its harshness. 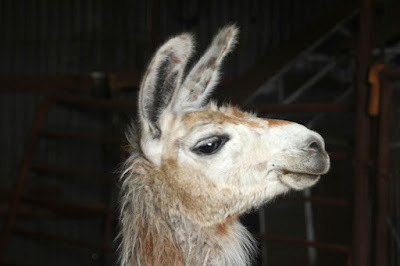 A llama in the stables. Another day trip we took with the granddaughters was to visit the Passow’s Camel Ranch. 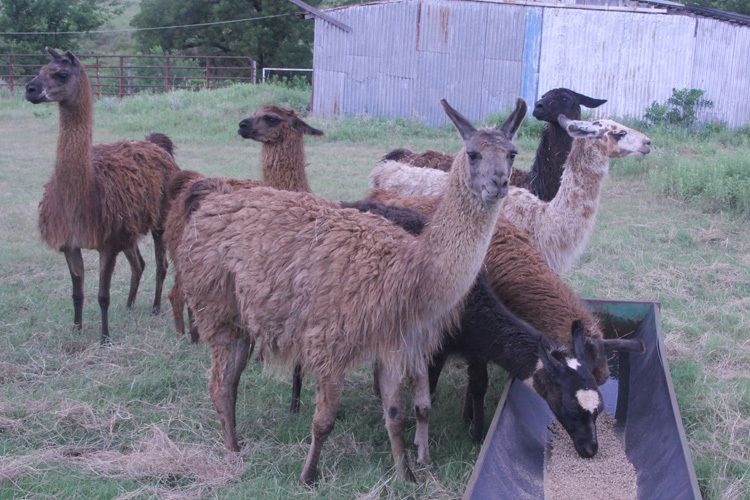 Owned by Ralph & Wynona Passow, the breeding ranch for camels, mini-donkeys, mini-horses, and llamas, is located south of Perry, OK. The owners loaded all of us on their ATV’s and rode all over the ranch, and even to a number of distant fields, to allow the girls to hand-feed and watch the animals up close. Camels, in particular the males during breeding season, are territorial and sometimes unpredictable, so they stayed right with us and made sure we moved safely about the animals. We learned a lot about the camels. Some interesting things were that only one-hump camels, called Dromedary, are generally raised commercially for food, milk, and transportation. They have a better temperament, and the two-hump camels, called Bactrian, are an endangered species. Camels do not have hooves, but broad, thick, leathery pads to keep them from sinking into the sand, and can run at 40 mph for short periods, and can maintain 25 mph. When they drink, they will down 5-21 gallons of water a day, but they do not sweat until temperatures exceed 106-degrees. Not sweating as much, and having the fatty hump to protect their bodies from the heating of the sun are what enable camels to withstand greater variations in availability of water. Also, their red blood cells are oval in shape, allowing normal blood flow when the blood thickens due to dehydration. They weigh between 500-1500 pounds, and live 40-50 years, and normally carry 200 pounds on their backs. In windy, sandy regions, their eyes have a second, transparent inner eyelid to protect their eyes from dirt and sand. One of the things you most often hear about camels is that they spit. 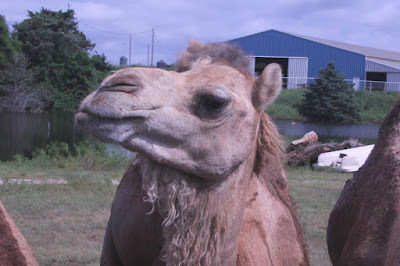 If treated well, camels are very docile and well-mannered. If they are ill-treated, however, they can quickly lose their sense of humor and become cross and difficult to handle. When they spit, it is not saliva, but even less appetizing regurgitated food. 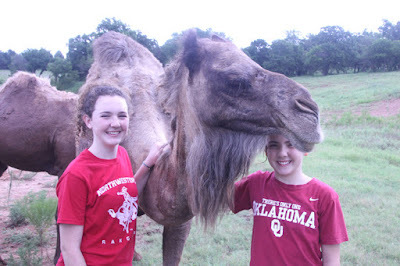 Maggie and Lucie feeding the camels. 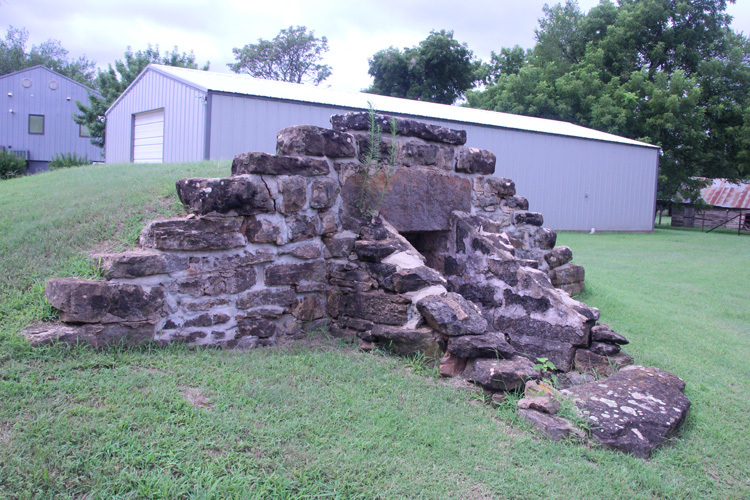 Having been on the ranch for generations, the Passows also provided a lot of local history on those that settled the area following the Oklahoma land rush. A few of their homes still stand in some condition. One still had remnants of newspapers glued to the interior walls that had been used for wallpaper. He didn’t say so, but since they had no insulation in the walls, the layers of paper probably helped keep the winter winds from whistling through. There was a root cellar on this property made from the stone found on site. Besides preserving garden produce, it doubled as a tornado shelter. When we prepared to check out the interior, he cautioned us about entering slowly and looking for rattlesnakes, as they often slither inside to enjoy the cool stones while escaping the sun. 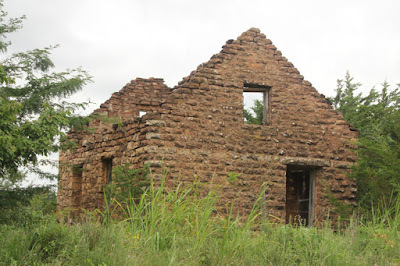 Further down the road was another original homestead made of stone. 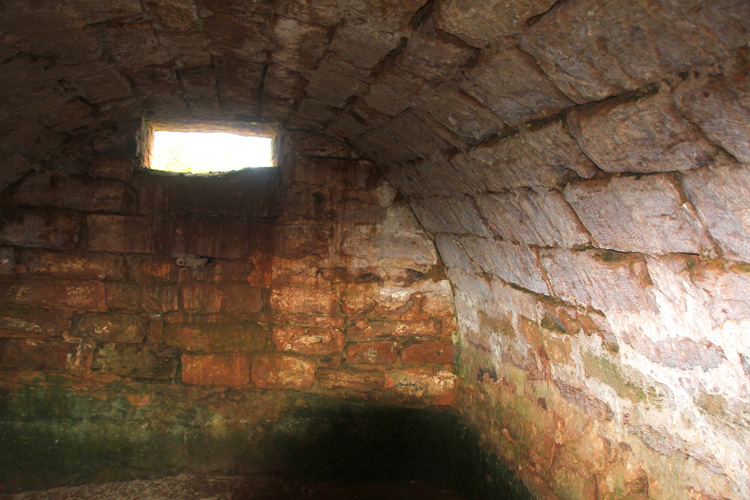 A root cellar of hand-hewn stone. ...and a view of the interior. The homestead of an original homesteader.